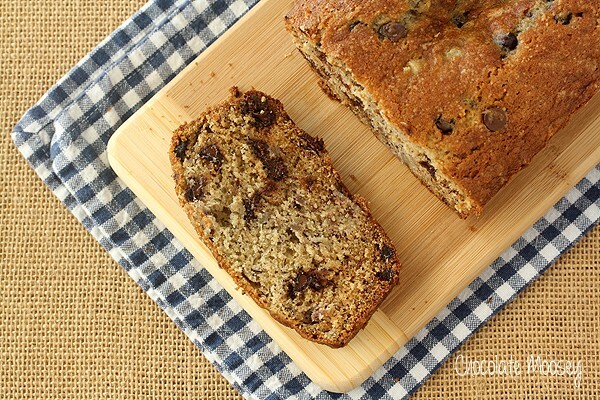 A fresh baked loaf of Banana Chocolate Chip Bread will fill your kitchen with love (plus four troubleshooting tips to bake up the perfect loaf). One of the best smells in life is the smell of fresh bread baking in the oven, especially when it’s as prominent as banana bread. You walk in the kitchen and go “mmm must be banana bread.” Banana bread reminds me of my mother. I haven’t made it in a long time, but when I used to live at home, she enjoyed it when I baked a loaf. 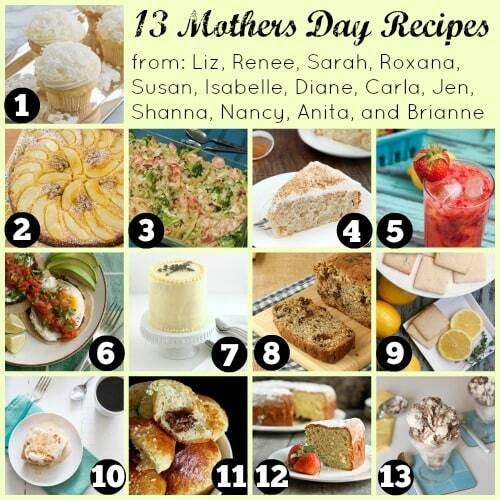 Today the Holiday Food Party bloggers are celebrating Mom for Mother’s Day. My mom is more of a traditionalist when it comes to recipes, which is why I dedicate this classic Banana Chocolate Chip Bread to her, a recipe I’ve been making since middle school. I was one of the lucky kids growing up who was forced to take home economics. We learned cooking, sewing, wood shop, and metal shop. Of course cooking was my favorite (but I did enjoy the hands on work of both wood and metal shop). I adjusted the original recipe slightly by lowering the baking temperature, using butter instead of shortening, and chocolate chips instead of nuts. Cover the bread with foil halfway through baking. My bread browned too much on top, making it look almost burnt. It makes you want to pull the bread before 60 minutes is up, causing the middle to be underbaked. The solution? Check on the bread after 30 minutes. If it’s browning a little too much, loosely lay a piece of foil over the top of the loaf pan before baking. Quickly ripen bananas in the oven. 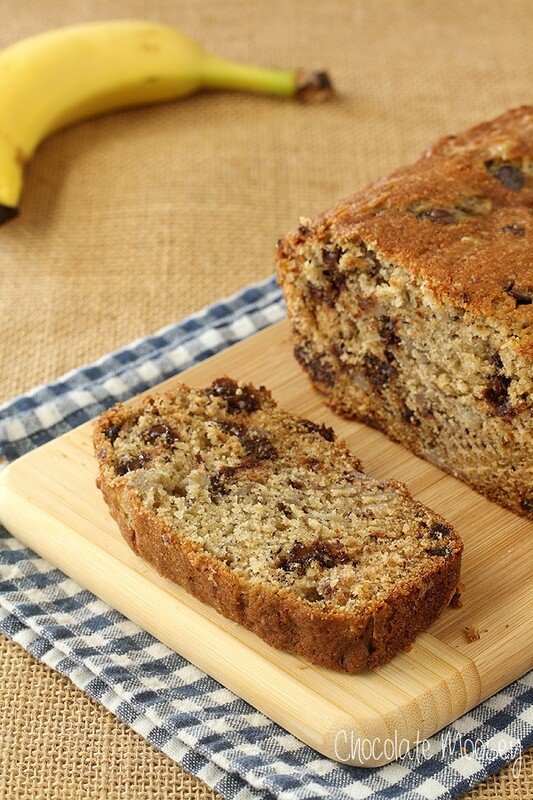 You need to use overripen bananas for banana bread, which means lots of brown spots and absolutely no green. If you plan ahead a few days, you can buy bananas and let them ripen naturally. I didn’t plan on making this bread three times, so that meant running out to the store for more bananas. And when you buy bananas from the store, they usually aren’t ready for banana bread. What’s a moose to do? 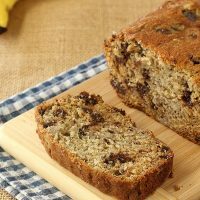 You can put the bananas in a brown bag, trapping in natural gas that speeds up the ripening process, but what if you need to make banana bread the same day? Easy – you bake them in the oven at 350F for 30 minutes! The peels will turn completely black but the inside becomes soft and slightly roasted. Cool them a few minutes before peeling and mashing so you don’t burn your fingers. 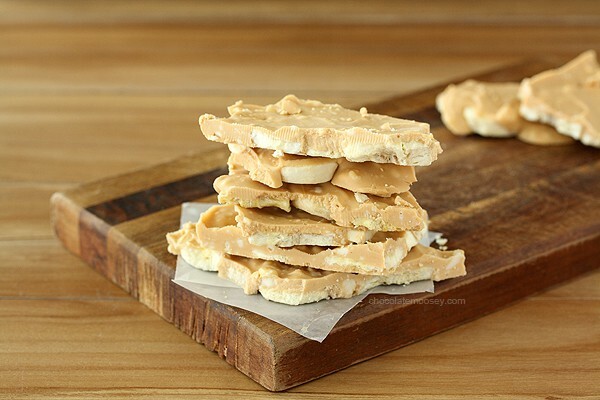 The bananas do leak juice a little, so line a cookie sheet with foil for easy clean up. Bake banana bread at 350F, not 375F. My original recipe said to bake at 375F, but the top burnt way before the middle was baked. I turned it down to 350F. Some say it’s because I used a glass loaf pan vs. a metal loaf pan. I don’t have a metal loaf pan to experiment with, so just bake it at 350F and use the toothpick test to make sure it’s baked. 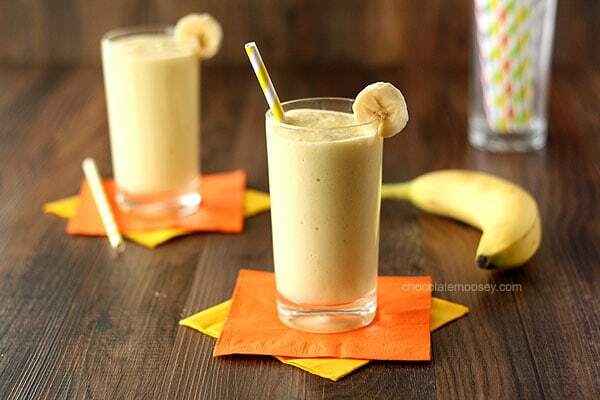 Don’t be lazy – mash your bananas. Don’t be like me and think the mixer will mash the bananas for you when you add chunks to the batter. Take a few extra minutes and mash them before adding. I used my potato ricer (Amazon affiliate), but don’t be afraid to relieve some stress and mash them by hand. It’s ok if there are a few little chunks, but you want it as smooth as possible. Preheat oven to 350F. Lightly grease a 9x5 loaf pan. In a another large bowl, beat together the butter and sugar until smooth and creamy, about 2-3 minutes. Beat in the eggs, one at a time, until incorporated. Beat in the mashed bananas and vanilla. Gradually add in the flour mixture (do not overmix). Stir in the chocolate chips. Scrape the batter in the pan. Bake 30 minutes then check on it. If it's browning too much, loosely add some foil on top. Bake for another 25-30 minutes or until a toothpick inserted in the middle comes out clean. Cool for 15 minutes then invert on a cooling rack to cool completely. 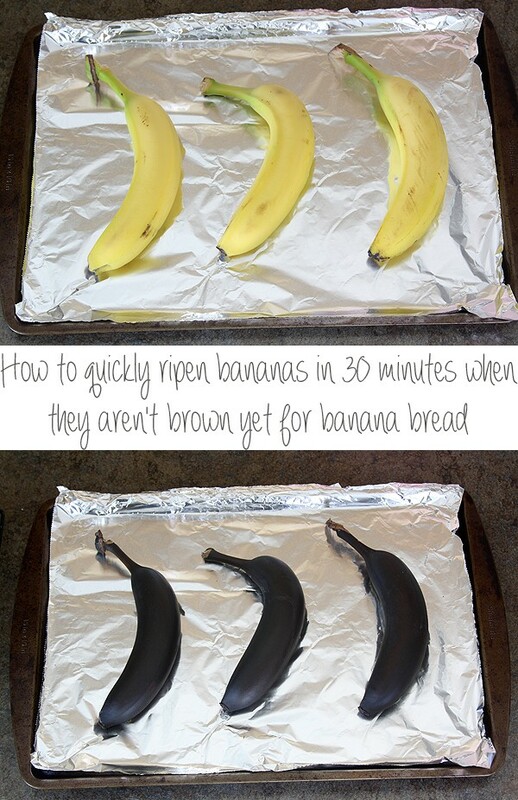 Great tip on ripening the bananas! 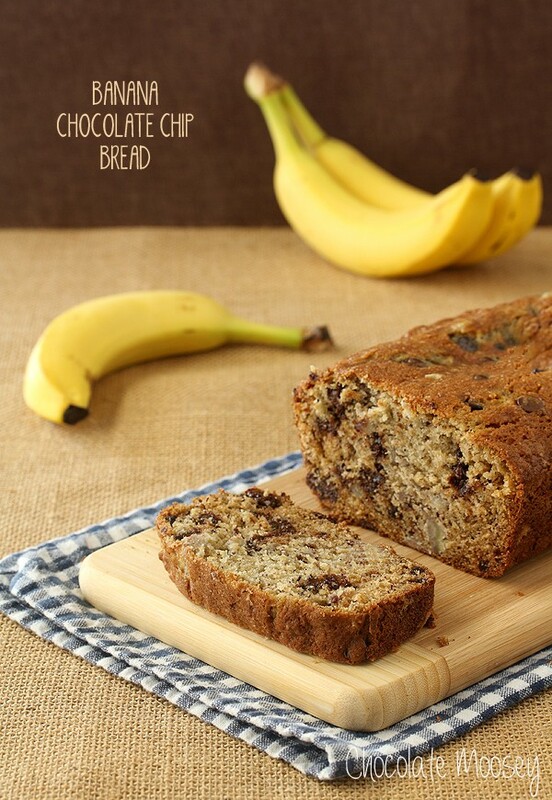 Because I need this banana bread ASAP!!! Your comment about what ‘s a moose to do about unripe bananas made me smile. At zoos, keepers frequently use bananas as treats or as a way of giving meds for the moose. Moose love bananas! Something so foreign to their natural diet of browse, etc. But like anything too many bananas aren’t good the moose. So they are just treats. 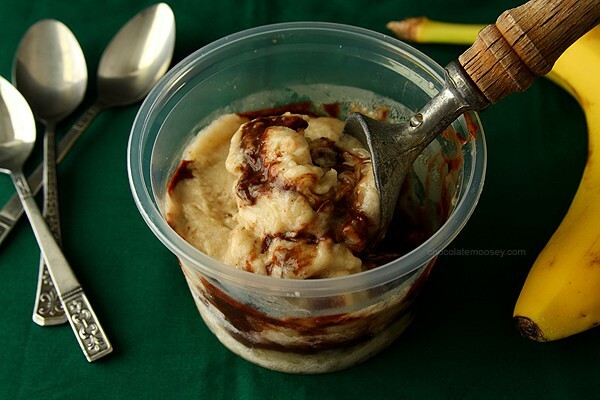 Think I will use some of my already mashed banana packets I have stashed away in the freezer to make up your recipe. Your pictures are very enticing. I agree that there’s something so homey about the smell of fresh baked banana bread! I’ve always baked at 350 and use only 1 egg but add buttermilk so I haven’t had the problems you did. But I have with other loaves so I’ll keep your tips in mind. What a wonderful bread and tips too. I’m definitely going to remember the ripening bananas in the oven trick. I’m always forgetting to get bananas ahead of time. Love that tip on how to ripen bananas fast! Plus this bread looks amazing! These tips are great! I hate when banana bread doesn’t turn out, because I rarely have over ripe bananas at my house. 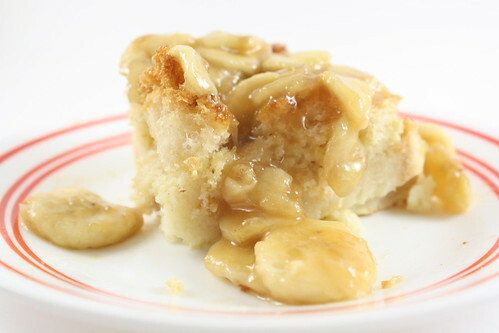 Although, I have to say, I don’t mind finding some chunks of banana in my bread, so I never mash them first! Thanks for the tips, girl. I’m sorry you had to bake this bread three times to get it right but we your readers benefited by learning from you. That’s an awesome tip about roasting the bananas in the oven to ripen them. I don’t think there’s anything more comforting than the smell of baking banana bread. I like keeping it classic too so this looks fabulous to me. Yumm. My mom makes an amazing banana cake. My mom is pretty traditional, to, and she and I would love this. And I loooove the banana ripening tip! Thank you for sharing that ripening tip, it’s genius! I would never have tried baking the bananas in the peel. Your recipe looks really good, and I LOVE putting chocolate chips in my banana bread. I’m pinning this for later! By the way, I’m hosting a link party on my blog right now and I’d love for you to share this post there. Have a great weekend! This is one of those comfort foods that I can eat by the loaf full. 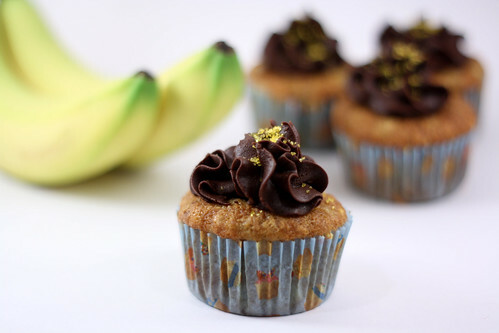 I need to incorporate roasted bananas into something soon! 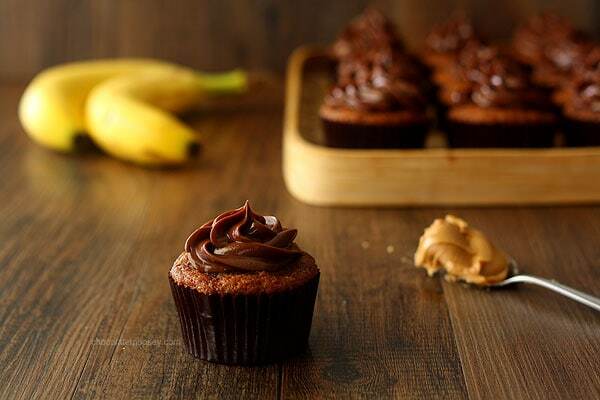 Oh how I wish I liked bananas because I could go for a slice of this! Also poor Braden he only gets banana bread when he visits his mom and she makes it! I’ll have to try that. I know most recipes are at 350F. Love the tip on freezing bananas! Made this with white chocolate as I had no brown. It worked just as well and tasted yummy! Plus one of the few banana bread recipe s that haven’t deflated and shrunk once out of the oven.